You will earn 3,678 Reward Points. Earn 1 reward point for every 1 dollar spent. Easy clean design with recessed protected controls. 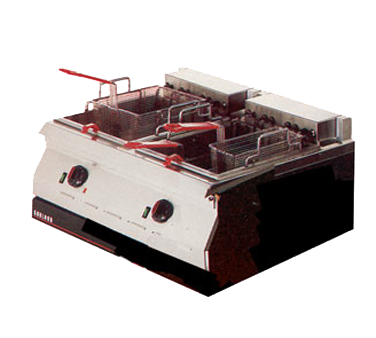 Electric designer series fryers in two size groups: Single tank models; 15" (381mm) wide ED-15F/SF, or 18" (457mm) wide EDU-18F/SF (CE approved); and twin tank models 30" (782mm) wide ED-30FT/SFT. Designed as free standing or to be banked with other ED series equipment. 24" (610mm) deep x 13" (330mm) high with stainless steel front and sides, and stainless steel tank. Electronic thermostat provides concise accurate control. Removable flat bottom stainless steel tank with large surge. Twin tank model has two sets of independent controls. 5300 watts per frypot, super fryer available with 8000 watts per frypot; models with suffix SF or SFT. Models with prefix EDU are "CE" approved.